Three kids later, I have some suggestions as to what baby stuff works out and what doesn’t. Learn from my mistakes! I bought many of these items twice because the first version was terrible. And online reviews are NOT always helpful. Buy this: baby monitor, not that baby monitor. I initially received the Graco monitor, pictured below, as a gift. I ended up buying an additional one with our second child. It would just stop working, seriously. “Oh good, the baby stopped screaming.” No, you just bought a bad monitor! I’d have to unplug and replug it to get it to work again. The Angelcare movement monitor, pictured above, has been great. What I really like about it is that our third child slept on his tummy as an infant. It would beep whenever there was no movement, or you could unattach the movement board and use it as a regular monitor. Buy this pack n play not that pack n play. Playards are a hassle to break down. But I’ve found what’s even more important than that is how comfortable they are. Because your baby doesn’t need an extra excuse to wake up fifteen more times at night, can I get a witness? The Baby Trend pack n play, showed below, features a mattress that is basically a board with fabric over it. Also, the pieces don’t line well, leaving an uncomfortable uneven surface. Maybe they’ve fixed it by now; I don’t know. But the Bright Starts pack n play, featured above, has a super-comfy mattress. And hey, I’ve finally arrived at the place where I can break it down without begging my husband for help! 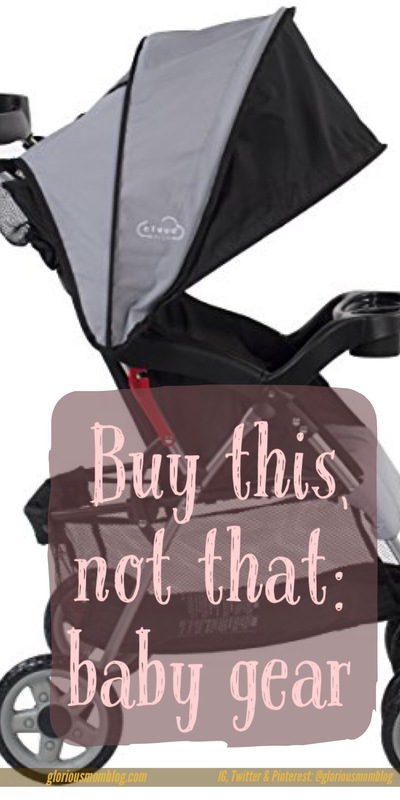 Buy this stroller, not that stroller. In this post here, I detail our trip to New York with the kids and how the stroller below completely fell apart while we were walking around in Manhattan. Not good. Even before it started perpetually closing while my kids were inside it, the wheels were doing strange swivelly-things that were making it near-impossible to navigate the throngs of NYC. The stroller above, Kolcraft’s Cloud Plus, has been fantastic. No inconvenient collapsing. In fact, you can push it with one hand. Extremely helpful with multiple littles. The wheels behave, and it collapses, when you want it to, easily. Buy this baby carrier, not that baby carrier. I will qualify this review by saying this: the Infantino is MUCH cheaper than the Baby Bjorn. So if you’re really strapped for funds, it definitely is not terrible. But in the first year of your baby’s life, the baby carrier is like a second skin to you. Especially if you’re a work at home mom. Especially if you have multiple littles. So I strongly recommend the upgrade to the Baby Bjorn, which is stronger, more durable, and provides better support. You HAVE TO buy a pumping bra! Okay, I don’t have a product to compare here, because I loved the first version. I didn’t realize these existed until my third child. I’m not even a working mom; well, I work from home, but if you’re a working mom and you’re pumping, get on it! It’s only $25! It makes such a difference. You have no idea. Everyone has their preferences, I get that, but some products are just problematic! 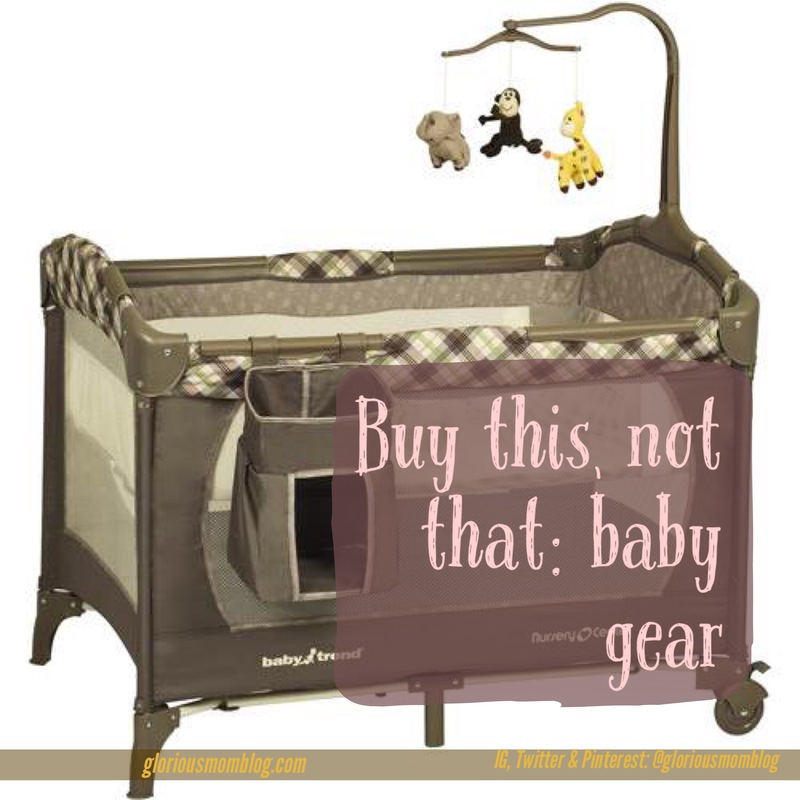 If you’re shopping for baby gear now, take my advice and buy something a fellow mama has tried and proven that works. We bought the Angelcare Monitor for our second baby, and it was so worth it! We still use it on the movement setting, even though we don’t need it anymore with our ten-month-old. I also like that fact that there’s a temperature displayed, and I can set an alarm to go off when it’s too hot or too cold in his room. I haven’t tried either of those carriers. We have the Ergo and it’s so comfy! I am saving this post to share with my preggo friends! There are so many things to choose from out there when shopping for baby it’s hard to know what is the best option! baby gear has changed so much! I had a baby 2 years ago and the things that are still coming out blow my mind. The BabyBjörn is really bad for your child’s development! The position of the legs and the back is not anatomically correct. Please stop recommending the BabyBjörn. I’ve never heard anyone say that. What’s your recommendation?